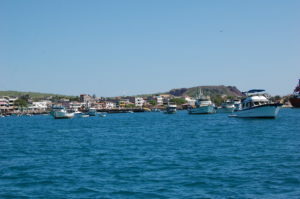 Many cruisers here in the Galapagos are, like ourselves, preparing for their longest voyage to date, and the activity in the harbor is apparent all around. Jugs of water and fuel are being delivered and sitting on side decks waiting to be emptied into the awaiting tanks. Awnings are coming down, dinghys are being hoisted and stored on deck, and windvanes are being prepared for the upcoming 3,000 mile passage. Our to-do list has been finalized and at a glance it doesn’t seem that long, but it just always feels like there are so many things to do. The southeast tradewinds have not quite settled in yet and we’re a little too far north for them anyway, so we’ll have to make our way south pretty quick to find some wind for our passage to the southwest. A rhumbline course from here to the Marquesas will keep us in light air longer than we have fuel to motor and will take us into a huge hole that’s about half way between us and the Marquesas. Everyone is watching the weather charts and forecasts closely and comparing notes at the end of the day when we get together after finishing the day’s chores. When we arrived the anchorage was quite crowded and now it’s nearly empty. Boat are still trickling in but more have left to go south than have arrived. We have a planned departure date of Wednesday morning, and will be leaving with our friends on Hello World and Carina. Hokus Pokus, a Swedish boat we’ve been anchored next to is leaving tomorrow morning on Mats’ (the skipper) birthday. The only fly in our ointment will be if we can’t get our new insurance finalized tomorrow. We’re insuring through a German company and the logistics of the time difference are causing some difficulties. But hopefully that’ll get ironed out tomorrow and we can check that off the list. There’s a morning and evening net where the boats enroute check in on the high frequency sideband radio and we’d like to start out with friends we’re traveling with so we can chat and compare weather and routes and things that are happening along the way. 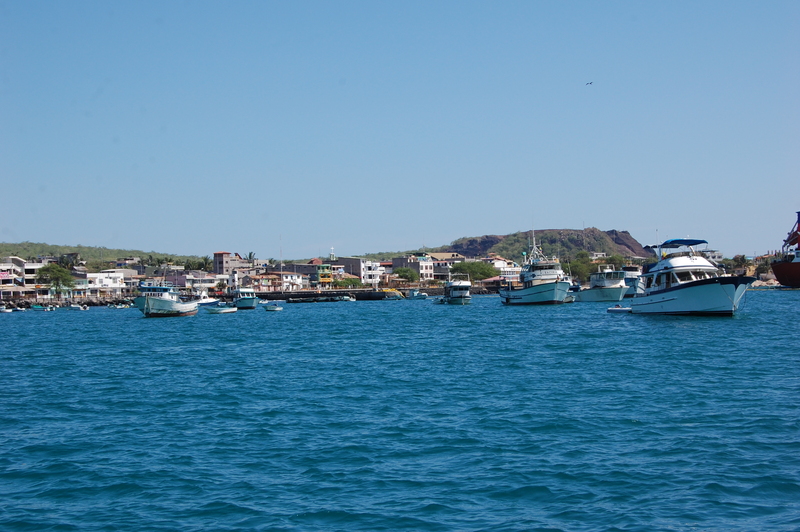 The Galapagos have been a very interesting stop and we’re glad we got to go on our little four day tour and see the sights. Of course there was more here we could have done, but we’ll weigh anchor on Wednesday and as always be thankful we got to experience what we did. We’re anxious to get this 20+ day passage started and see how the winds will be. 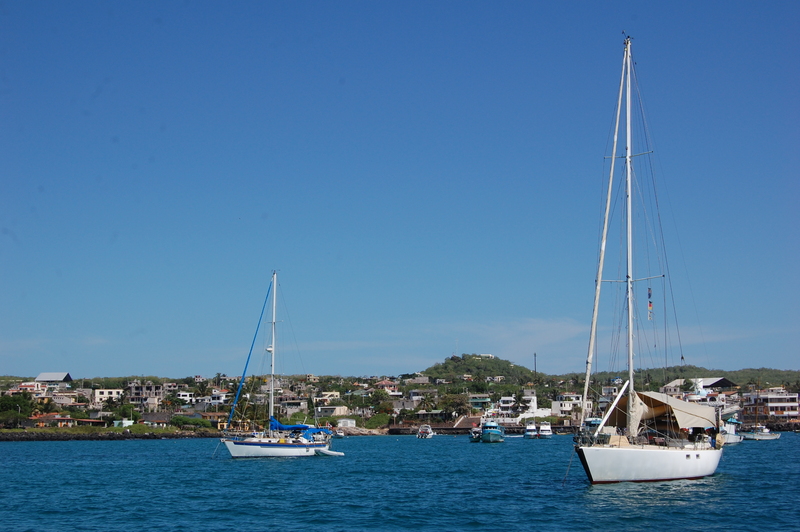 Landfall in the Marquesas will be very exciting for us and we’re ready to be on our way. French Polynesia is a highlight for many sailors and we’re happy to be joining that crowd this year. Today on Yohelah we’re nearly ready to go and very excited for our upcoming 3,000 mile voyage…..